Roasting tomatoes at a low temperature for a couple of hours results in a complex, richer flavor. These are the perfect topping for pizza, pasta and salads. After a few months of stepping away from the blog, I’m back! I fell off the writing wagon for awhile because life got busy, and I honestly wasn’t feeling very inspired in the kitchen. Sometimes you just have to get a meal on the table as quickly as possible, and there aren’t enough hours in the day to make the perfect meal. But, that’s life! I hoped things would slow down a bit over the summer, but this seems to be our busiest season every year. There’s just so much going on in June and July — holidays, birthdays, all sorts of celebrations. It’s all so much fun, but sometimes it’s hard to juggle it all. But there’s something about all of the delicious, fresh produce that comes along during the summer that makes me want to embrace simplicity. When you have high quality ingredients that are naturally bursting with flavor, there’s no need for meals to get complicated. I can’t get enough melon lately, and the tomatoes I’ve been picking from our garden are to die for. I didn’t like tomatoes at all as a kid, but they’re one of my favorite summer treats as an adult. While BLTs and panzanella are delicious, my favorite way to enjoy summer tomatoes is actually by slow roasting them. We grow three varieties in our garden and, when I’ve got more tomatoes than I know what to do with, I throw them in the oven for a couple of hours with some good olive oil and fresh herbs. Cooking them low and slow almost caramelizes the tomatoes, drawing out their sweet and acidic flavors. And, they make your house smell delicious — definitely worth turning the oven on for in the middle of the summer. Once the tomatoes are done roasting, you can store them in a jar in the fridge until you’re ready to use them. I like to throw them on sandwiches and salads, but they also make for the best pasta or pizza sauce ever. All you have to do is sauté some chili flakes and garlic in a saucepan, then add the tomatoes and crush them up a bit with a wooden spoon to draw out some of the juices. I like my sauce thick and rustic, so I just let it simmer this way until it breaks down a bit and the flavors come together. Throw some chopped basil in at the end and you have a ridiculously delicious sauce. You can use this recipe with any type of tomato, but the cooking time will vary based on their size. 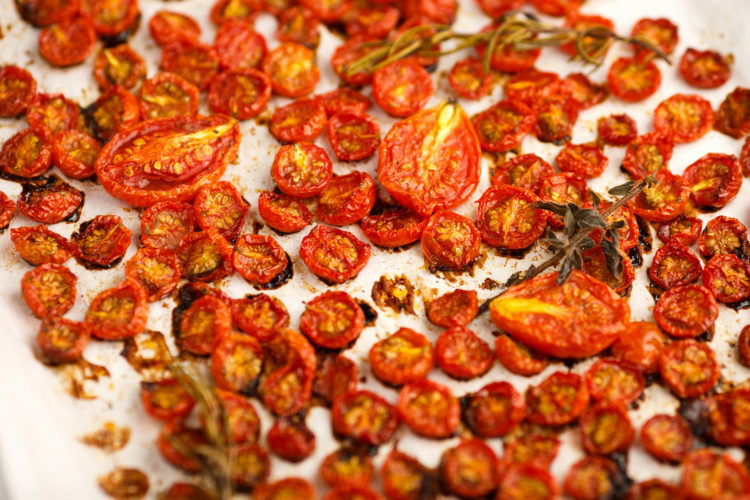 If you’re roasting several varieties at once, you’ll want to keep a close eye on them and pull out the smaller tomatoes early so they don’t get burnt. I like this recipe best with a variety of cherry and Roma tomatoes. Preheat the oven to 300 degrees. Cover a large baking sheet with parchment paper or aluminum foil. 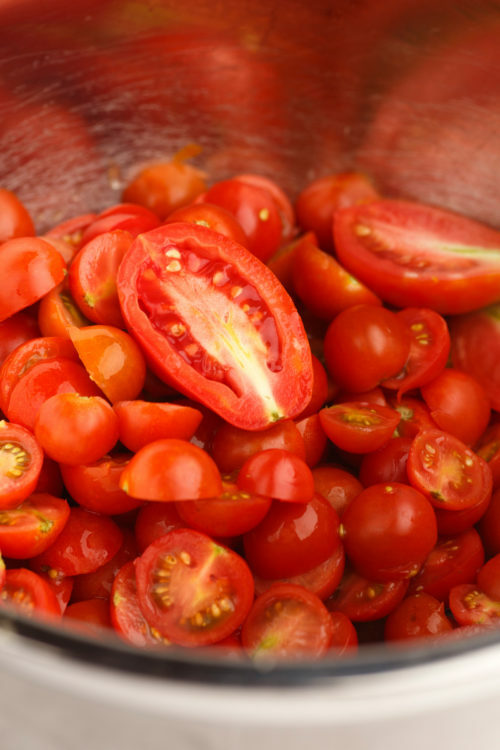 Place tomatoes in a large bowl, then toss with olive oil, herbs, salt and pepper. Carefully spread tomatoes in an even layer on the baking sheet, making sure the cut side of the tomatoes is facing up. 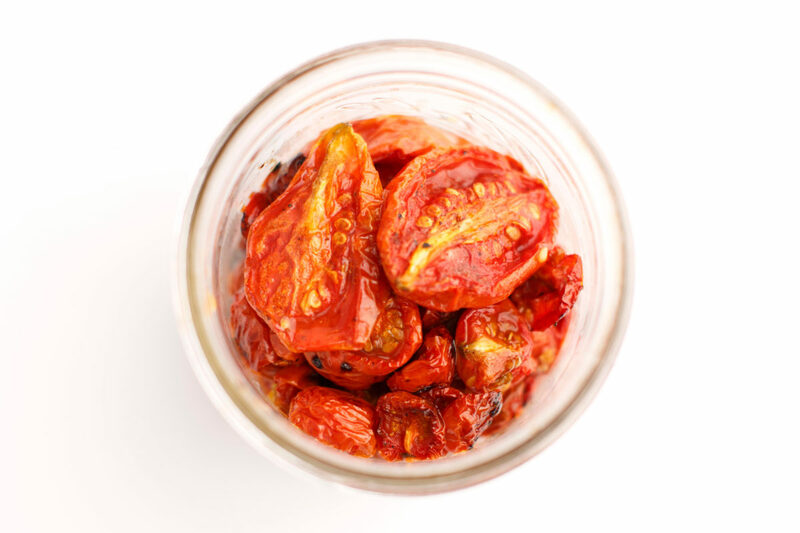 For small varieties of tomatoes like cherry, roast for 1.5 to 2 hours — until the tomatoes are shriveled but still have some liquid in the middle. For medium and large varieties of tomatoes, roast for 3 to 4 hours. Allow tomatoes to cool on baking sheet until they reach room temperature. Transfer tomatoes and any oil into a large mason jar and store in the fridge for up to five days.